"I want to tell you that Faryab is not in your hands." Those were the words of Fathulla Qaysari, a member of the Afghan parliament representing the northern Faryab Province, and Qaysari was directing his comment to Interior Minister Nur ul-Haq Ulumi. Qaysari gave a passionate and brutally frank speech to the defense and security committee at Afghanistan’s parliament on April 14. "We always say that 80 percent of the provinces are under Taliban control and in front of you I say once more ‘yes,’ and the remaining 20 percent where your district and provincial centers are located, even they are under Taliban control," Qaysari said. 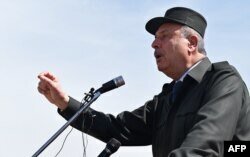 RFE/RL’s Turkmen Service, known locally as Azatlyk, has been following events in northern Afghan provinces bordering Turkmenistan for more than a year. The security situation there has been deteriorating during that time. Officials and residents of these northern Afghan regions have spoken with Azatlyk, but none gave such a dire appraisal of the situation as Qaysari. "For example," Qaysari continued, "if you are an entrepreneur, the Taliban will call you asking to send a certain amount of money and the entrepreneur does it immediately. So who controls the area? I would say the Taliban controls it." Qaysari claimed, "Now the Taliban is very much at ease [in Faryab] doing what they want to do. They are planting opium poppies there at this moment." Qaysari challenged the interior minister: "If you want, let’s go to Faryab tomorrow. If you find I was lying, you can curse me to my face, call on God to damn me." Qaysari said "the people [in Faryab] who give you reports about peace, they lie," and Qaysari accused the government’s "prominent commander" in Faryab of embezzling money and sending his family to Canada and Sweden. Qaysari mentioned a recent military operation in Faryab to clear Taliban militants from the Shirin Tagab area. "After that, we got reports from your security forces that they had driven out the militants but in fact these [militants] move like nomadic herders. So they are gone, yes, but your security forces say we conducted a security operation and drove them out. To put it briefly, the 14 districts of Faryab are gone! I cannot say they are under government control. You can continue to say what you want." Qaysari said he had not come to parliament as an enemy of the interior minister. He pleaded for the government to establish a permanent base in Faryab with 700 to 1,000 soldiers and said he and local officials would be glad to provide advice that could turn the tide against the Taliban. Qaysari even said the people of Faryab would cover half the expenses of the military base and troops if it meant the government would finally drive the Taliban out of the province. To the east, in Jowzjan Province, Ahmad Jaweed, the head of the Hamyab district, which borders Turkmenistan, claimed to Azatlyk that a security operation is being planned to drive out the Taliban fighters. Jaweed said nearly 300 soldiers are due to arrive in the region shortly to launch attacks on Taliban areas. Azatlyk mentioned to Jaweed that previous security operations in Hamyab district had also forced Taliban militants to flee the region but they returned after the soldiers left. Jaweed said this time it would be different. An Azatlyk correspondent in Hamyab spoke with local residents. They said that after two soldiers were wounded by a land mine on the road to Hamyab, the entire force turned around and departed the area without engaging the enemy. The one possible bright spot in this depressing description of the situation in Faryab and Jowzjan provinces is that no one mentioned foreign militants.